I hope everyone had a wonderful Thanksgiving! Now that the holiday has passed, the remaining weeks are going to go by in a flash. The week before Thanksgiving was extremely hectic at Walsh – the students had a test, two field trips, a merit party, and report card pickup! Despite the lack of academic instruction that occurred that week, it was great to reward the students for their hard work throughout the first quarter of the school year. The students had the opportunity to attend a high school fair at Benito Juarez, the nearby neighborhood high school, during which representatives from various high schools presented information about the programs and opportunities offered at their schools. Eighth grade students must submit their high school applications by December 15th, and the fair seemed to be a good way to help the students learn more about the schools to which they are considering applying. We also got to attend a musical of The Addams Family, which was performed by students from several of the local high schools. Walsh’s middle school students loved the musical and the fact that they had the opportunity to ask the cast and director questions following the performance. The staff of Walsh’s middle school uses an app called Class Dojo for their behavior management system. Students can be awarded points for positive behaviors, and points can be deducted for predetermined misbehavior. Students who had accumulated at least 125 points during the first quarter of the school year were invited to attend a merit party. The party included a raffle, food, board games, video games, and movies. The party provided students and teachers with an opportunity to continue building positive relationships in a less academic setting, and it has been a good incentive for students who did not make it to the merit party to improve their behavior during the second quarter. 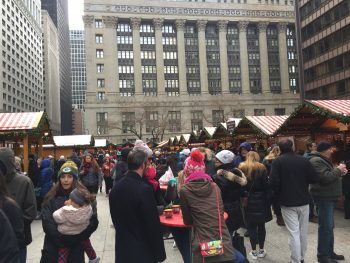 As we approach December, the weather is getting colder and holiday festivities are occurring throughout Chicago! Macy’s had a tree lighting event to celebrate the giant Christmas tree they put up each year on their seventh floor, and we had our first snowfall that resulted in snow on the ground – even though it only lasted for a day. 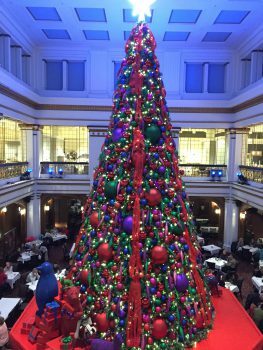 The Christkindlmarket, an open-air Christmas market based on a similar market in Germany, has opened for the season. The market features a wide variety of handmade Christmas themed items, primarily from Germany. Even though I could only afford to do a little Christmas shopping there, it was amazing to see the beautiful ornaments, woodwork, and other artifacts from countries throughout Europe. The market seemed to be very crowded, but I overheard conversations from more frequent attendees of the market that mentioned how much less crowded it was that day compared to usual. I suppose I picked a good day to go! As the weeks go by, I find myself making more frequent trips to the panadería across the street from La Casa. As soon as I step inside, the aroma from the variety of baked goods is enough to ensure that I will be leaving with a small paper bag filled with different types of muffins, breads, and cookies. 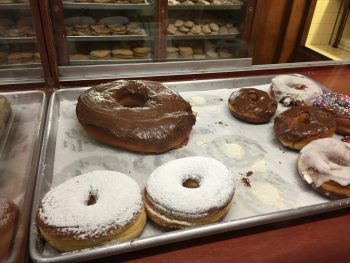 Last time I stopped into the panadería, I saw something new – giant donuts! The most surprising part of that trip was not the donuts, however, but the customer who bought three of them. The picture of the one large donut remaining next to the other regular sized ones doesn’t do them justice. Since I only have three weeks left in Chicago, I’m sure I will be making countless more trips to the panadería, as well as to other events around the city in order to make the most of the short time that remains in the semester. It’s going to be extremely difficult to leave my students and the city once the semester is over!